The Science Laboratory Building (SLB) is home to many classrooms, teaching labs, faculty offices, research labs, and state of the art research facilities, including the adjacent Biological Sciences Greenhouse. A skywalk connects the third floor of SLB to the second floor of Julian Hall, where the Chemistry and Biological Sciences Departmental Offices are located. 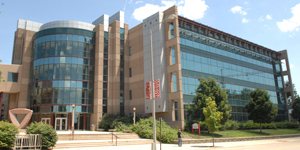 The Science Laboratory Building was dedicated in 1997 and has already won many awards for its design. The Biological Sciences and Chemistry Departments obtained extensive scientific instrumentation for teaching and research in 1997 when SLB opened. A $3 million dollar allocation from the state was matched by a $3 million dollar grant from the Arnold O. Beckman Foundation. Beckman was a graduate of U-High and went on to invent the pH meter and other instruments and founded a company to manufacture them for the scientific community.